According to a recent White House Press release, President Obama announced a new goal of recruiting 10,000 Science, Technology, Engineering, and Math (STEM) teachers over the next two years. Students in the U.S. lag behind in math and science when compared to their peers in other countries and the government wants to see improvements in STEM education. Even at my daughter's school I've noticed they've started to put more of an emphasis on math and science. Each week in kindergarten, my daughter observes and participates in a new science experiments and every week she brings home a math at home worksheet to complete. This fall I've been trying to focus more on science and math with my kids in our daily lives. While the school will teach the basics, I believe it is important for us, as parents, to encourage the curious minds of children through simple home activities. Starting this past month, we've been trying to participate in Science Sunday every week. Just recently through Mom Central, I learned of a new science publication for kids ages 6 to 9. 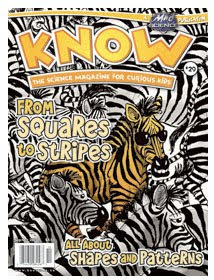 KNOW: The Science Magazine for Curious Kids by Mad Science contains short articles and plenty of engaging pictures, experiments, games and activities to help children think scientifically. Right now a free online copy of the Sept/Oct 2010 KNOW Magazine is available for download. A bi-monthly publication, the yearly subscription rate for the U.S. is $28 (Canadian dollars). That price doesn't seem too bad, especially considering the magazine contains very few ads. My kids and I really enjoyed browsing the magazine online. The articles are laid out in an artful, eye-pleasing way, with the right balance of text and pictures on each page. This newest issue contains all sorts of interesting pieces on shapes, patterns, origami and more. The see-through frog on page 3 amazed my children and they wanted to know more about it. We used the page on Fibonacci Fun in this issue as the basis for one of our Science Sunday posts a few weeks ago. And, there's even a page featuring book reviews by kids! Hooray! This magazine looks like an excellent supplement for home science studies. I also think that the publication might be a good one for public and school libraries to offer for check-out to their patrons. Magazines like KNOW provide the perfect stimulus for kids and parents to talk about and learn about science together. "I wrote this review while participating in a blog tour campaign by Mom Central on behalf of Mad Science and received the products necessary to facilitate my review. In addition, I received a gift certificate to thank me for taking the time to participate." Just catching up on reading your blog posts. Sorry I haven't commented but something in this post caught my attention: I like what you have to say about parents taking responsibility for the education of their children. I agree. I applaud you for the efforts you are taking with your children. And, I love the science and art projects I see here on your blog. Keep up the good work.